Only a few people have two identical digital movie cameras at home. If you have them then it's very easy for you to create a 3D movie. Just place the two cameras beside each other - like 2 still cameras when taking 3D pictures - and start recording. (You can even try to connect the 2 cameras to start recording synchronously). After finishing the recording you have only to do a few actions described later in this article. The second choice is to buy a special 3D adapter for your movie camera - but it's not cheap nor universal solution. What is easily affordable is the third choice - to use a movie camera and a digital still camera which can record short videos. It's sure that the quality won't be so great like in 3D cinema, but it's worth trying - today's photo cameras take quite a good video. And one more thing: Thanks to new version of 3DJournal software you can create 3D movies more easily than before - read more info in this article. Place both cameras (still, still and video or 2 videos) one beside the another - each of them should be directed in the same direction - to the scene. Keep the same rule as with taking 3D photos - the distance between the cameras should be 1/30 of the distance from camera to the nearest recorded object. Prepare your actors and start recording - simultaneously at both cameras. It's only a small chance to start the recording absolutely synchronously, but it's not a serious problem. Download both recorded movies to your computer as usual. And now we will do some conversions. If you use a recording from a still camera (often as a MOV file) then you probably have to convert it to MPEG or AVI. We recommend TMPGenc software, which is available (as a trial version) on this address . (You can find this and the next links on our download page as well - on this page we update the link if necessary). Decompress the archive and copy to a directory. Then copy the file QTReader.vfp, which is possible to download from here, to the same directory. Start the software, set the right format (for example PAL in Europe or NTSC in USA), choose a video file (your recording) and press the Next button until the conversions finishes. The first method of creating a 3D movie uses an appropriate video editing software with color effects. You can use free software Zwei-Stein, which is possible to download from this page. (You can find this link on our download page as well - on this page we update the link if necessary). Install the software and run it. Now click with the right mouse button to the text "Right click here to import media clip". Choose Import media clip and load your right-side recording (recording from the right camera). Then click to the same place once again and load the left-side video. Click to the first recording and use the button Add Video Effect - select Basic Effects - Mapper. Set Map Green and Map Blue to 0, upper bar of Map Opacity set to 0.5. Click to the second movie and Add Video Effect - Basic Effects - Mapper. Set Map Red to 0. Both videos were probably recorded by different camera - and shows different size of the scene. Click to the recording which shows a bigger bart of the scene and resize the frame in the left upper corner of Zwei-Stein software to select only the same part of the scene, which is recorded on the second videoclip. Now shift the clips on the timeline to show the same moment in the same time on both clips. You can check it visually in the preview window - on the right side of the software window. To show different part of the clip just use the bar above the clips. Finished video can be saved by File - Export menu. The 3D video is created using opacity - not by adding colors - and the video can be quite dark. If you want to change it then use a video editing software to change brightness and saturation. You can change source clips or 3D video as well. 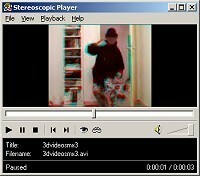 The second method of creating of a 3D video uses the Stereoscopic Player software (we've written about it in this article ). Just create one movie where the left clip is in it's upper half and the right clip in the bottom half. You can use Zwei-Stein software again. Make the same steps like in the previous method, but don't use the Mapper. Click to the first movie and resize it's window in the preview window on the right size of the software window - the video should be played only in the upper half of it. Then make the same step for the second video - but this time place it to the bottom half. Use the File - Export menu to save the movie. The colors should be OK now, but the video is distorted. You can use an ordinary video editing software to resize it if you wish. It's necessary to say, that videos recorded by different cameras may have a different framerate - and it may be visible in the 3D movie. If the cameras aren't properly synchronized then there can be seen these differences as well. But it shouldn't be a big problem. When you stop the 3D movie it's visible - but when you watch it in move the result should be very satisfactory. We wish you to create nice 3D movies!